This Spring when I planted potatoes in my vegetable garden I started thinking once again about the horrible times when the potato famine started. Yes, indeed that was when many of the Irish starved in the thousands and immigration started to get away from the devastation happening in their country. So I decided because of the history to do more research and find out more as I certainly knew about the famine and wanted to learn more about it. The after effects and how long did it last? What were the consequences? So this is my story of that time. Not finished tracing my Paternal grandmother who was from Ireland, I was also curious if this was the reason some of her family immigrated. Alas, I will likely never find this out. To find out more about the famine we are going to travel back in time. I will begin with the first famine and wonder why 100 years later it was back and called the Great Famine. It was certainly not under the same circumstances. This was definitely a disaster in the making and it all came to a head in the year 1740. One year and in that time 38% of the population of over 2.4 million people had died. This makes it a greater loss than the Great Famine of 1845 – 1852 which is more known. Cemeteries provided some information on the death rate. It was noticed that the death rate had tripled in January and February 1740 and the burials were 50% higher. It was considered the coldest winter and starvation and outbreaks of fatal diseases was the cause of both the grain and potato failure. Blight caused the potato to rot because of the cold. In the 1700's they did not keep records of the temperature like we do today, so we are lucky that people kept privately their own records and it has been shown that the temperatures were as low as -10 Fahrenheit which is -12 Celsius. This would not have taken into consideration the wind factor which would have made it more drastic. Deaths and starvation would have been more drastic living in the city, as the dwellings were damp and houses were not insulated in those days, just thinking about it gives me the shivers as they would not have had warm enough clothing for that kind of temperature. The people in the country would have fared better as they were likely more adept at dealing with much colder weather. One of the reasons the frost affected potatoes which were a staple of the Irish, it has been reported the Irish were dependent on their potato crop and have eaten up to 14 pounds of potatoes daily. Crops were frozen and inedible not even seeds could be saved from the crop for the next years planting. In the Spring no rain came, this destroyed the grain crops as well. One disaster after another kept coming for the Irish. The potato crisis caused an increase in grain prices, this resulted in smaller loaves of bread for the old prices (just like today the quantity has shrunk in size with the price not shrinking with it) in some cases the prices have risen. As expected there were food riots and city officials tried to find the culprits as the grain was been hoarded so the supply was lower than it should have been. In order to restore peace, troops from the Royal Barracks were brought in. This resulted in the killing of some of the rioters. Calm was a long time coming and the prices remained high through that summer. The year 1741 during which the famine was at its worst and mortality was the greatest was known in folk memory as the “Year of the slaughter” - “Blain an air” in Gaelic. Now to go forward 100 years to what is known as “The Great Famine.” The years 1845 – 1852 What lead up to it? The Absentee landlords had a big hand in this famine. So greedy for money, they kept taking away more and more land of their tenants dividing it up into smaller parcels and people were reduced to less land to plant and since potatoes were the main diet that was all they planted. All the money these absentee landlords received wall all taken out of the country to England where most of them lived, so the economy of Ireland was also suffering. It must be noted that some of the landlords did live in Ireland, and they did try so hard to look after their tenants, but they were few and far between. They also suffered during this time as well. The land was not being fertilized which it would have badly needed to help enrich the soil. Another reason the potatoes got blight and diseases that destroyed the leaves and the edible roots of the plants. 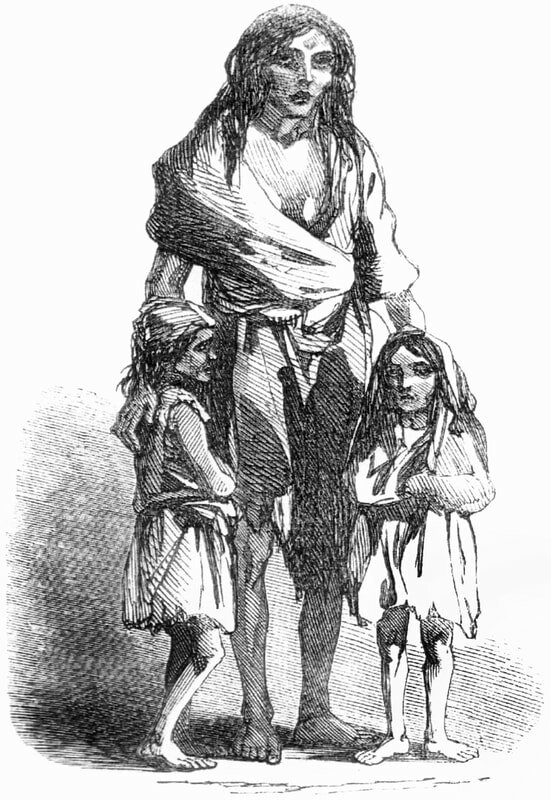 This famine also started the Irish souring against the high aristocrats – the English. Relief funds were set up by the British and American public. Thousands of pounds were raised. One of the most surprising was raised by the Choctaw Indians and sent it to the Irish relief fund of America to be sent to Ireland. The reason it was believed that the Choctaw Indians donated was from their experience on “The Trails of Tears” when they were relocated from their Indian Territory that was now being taken away from them by the U.S.Government.The prime location they had was one of the reasons the U.S.Goverment wanted it. This was winter time and the blizzards and the Cholera epidemic along with starvation took its toll. This happened 16 years before the great famine so it touched the native Indians very much, they had meagre funds and were still willing to help others in need. 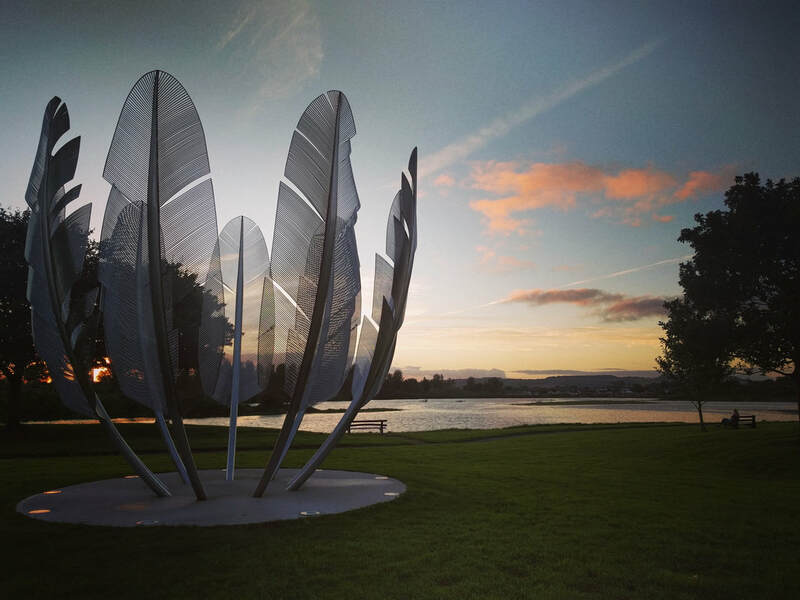 The Irish people had a statue made in honour of the Choctaw Indians and it shows 9 Feathers. 9 is the number of treaties the Indians signed with the U.S.Goverment. Unfortunately, with these donations, the British authorities did not believe in giving the Irish the food they so badly needed without making them work at menial physically demanding jobs such as manually breaking boulders so they could get their food rations. Those that were weak and could not work were not allowed any food, the authorities believed that a handout was not the way to go as they did not want the Irish to get lazy and expect the food without working for it. The British also opened up workhouses for the women whose husbands were either ill or in jail as no one had the money to pay their rent anymore.These women also had to work during the day for food and staying in the workhouse. Children over 2 years of age were taken from their mothers and put in another workhouse where they were also forced to work. The stress of being taken from their mother and the diseases not many survived these horrible conditions. A lot of this was not known, it was during an interview in an Irish newspaper of a woman that had survived the famine and what she had gone through. Her husband was thrown in jail and then shipped out to the colonies. She was pregnant, and she and her kids were also thrown out of the house and the absentee landlord took their supplies so they had no food, lost the baby and a few of her kids died from starvation. This was the way the absentee landlords treated their tenants. No regard for their welfare. This all came to light and similar stories began to be told of the horrors that people had been put through. Immigration was the only way out for a lot of these starving people. The largest graveyard outside of Ireland is in Canada. It is known as Grosse Isle and the Irish Memorial National Historic Site, which housed Irish immigrants coming to Canada to escape the great famine.This was previously set up to contain an earlier cholera epidemic that was believed caused by the large influx of European immigrants. Thousands were quarantined on Grosse Isle, in the Province of Quebec from 1883 – 1848. It is believed over 3,000 died on the Island and over 5,000 is buried in the cemetery. It is believed that over 2,000 died on the route on the ships. This island is sometimes called Canada's Ellis Island and also shares that name with Pier 21 in Halifax, Nova Scotia, where it is another port for immigration. The Canadian winter would have also played a large part in all of this, as the Irish who were weak and malnourished and goodness knows what else they were suffering from just could not survive the terrible cold and snowy winters that Canada gets. Some landlords forced immigration of their tenants in an effort to solve the problems. The disgrace of all of this was that the absentee landlord was Lord Palmerston, the British Foreign Secretary and he was one of the most famous of Britain's politician. In 2011 the Queen apologized to the people in Ireland for the way that London had treated them during the great famine, she did this on her tour to Ireland. Now to bring attention to another famine which is not as well known. This was in the Highlands of Scotland and the years were the mid-1840's. This famine also started immigration mostly to Canada and Australia and a lot also moved to the lowlands of Scotland to start a new life. It is estimated that about 90,000 immigrated from 1841 to 1861. Scotland did not have the hunger problems Ireland had as the rest of Scotland rallied round to help them, and funds were raised for this purpose. In America, the Scottish American society helped raise funds for the famine as well. It was very hard times for the people of Scotland. The British authorities though did inflict upon the Scottish people the same way they did with the Irish, they made them work every day for their food rations as they believed the people would not better themselves and depend on these handouts. The landlords helped their tenants one example is Sr. James Matheson, he spent over 33,000 Pounds in three years to support the tenants on the Isle of Lewis. During the next thirty years, he helped them another six times. A big difference from the absentee landlords in England who had no compassion for their tenants in Ireland. Although many stories have been written on these famines. It is still so very heartbreaking. As I stated earlier, planting in my garden is sometimes filled with the horrors these people have endured as well as a warmth in my heart for the survivors.